Welcome to my post for this month’s House of Cards challenge: Bokeh. Have you tried the Bokeh technique before? Well, I knew the technique but had not tried it yet. This technique imitates a photography effect that plays with light. I hope you get a chance to visit the House of Cards blog to see all the different samples that will be shared starting today and of course to join the challenge with your take on the Bokeh theme. I want to apologize for the pictures because it is raining and I had to take them in my craft room. The card looks prettier in “real life” but you can sure see well the Bokeh background. I used earthy tones for the background, because I wanted to make a vintage card. Something basic to have for this technique is a circle stencil, at least that makes the process way easier. I used a homemade stencil with different sizes of circles created for me by my friend Sue (here) and applied four colors of ink with a sponge dauber. I used Distress Inks and white pigment ink in the end. I tried to apply the same tones of inks in different intensities and also sprayed water to soften and blend the colors. 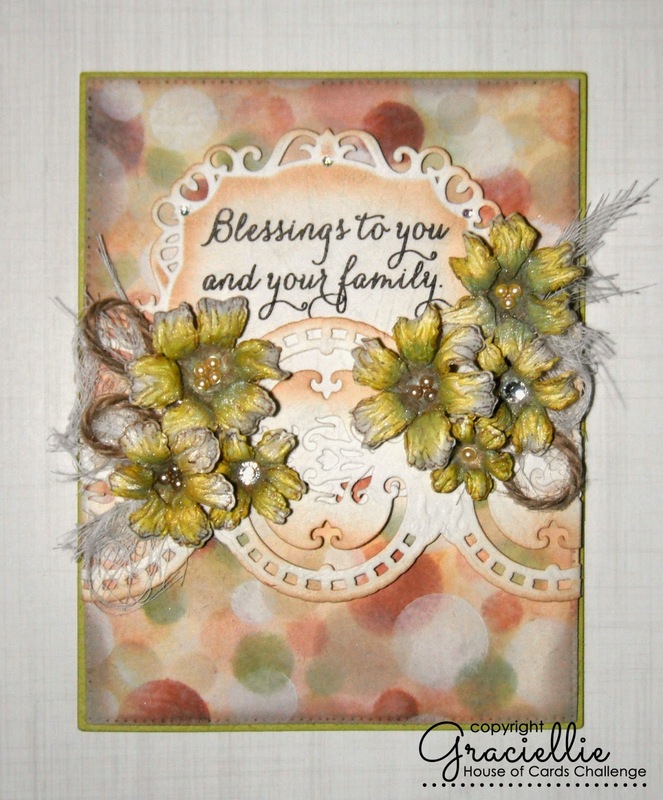 I completed my card with flowers, die cuts, a few embellishments and a beautiful sentiment. I hope you enjoyed seeing today’s post. Thanks so much for your kind visit! If you have any questions feel free to send them in and please don’t forget to subscribe to my newsletter because I will be sharing giveaways and tutorials soon! This is just lovely. So soft looking. Beautiful bokeh effect! I love your pretty color combination! Great card! How beautiful, Gracie, and I love your Bokeh background…stunning! And what beautiful flowers with your lovely array of dies! Stunning card, sweet friend! I am never disappointed! Hugs! Absolutely gorgeous! I am going to have to try Bokeh. Thanks for the inspiration. Aww, your bokeh is fantastic, Gracie!!! Love the colors and the way you made your card! 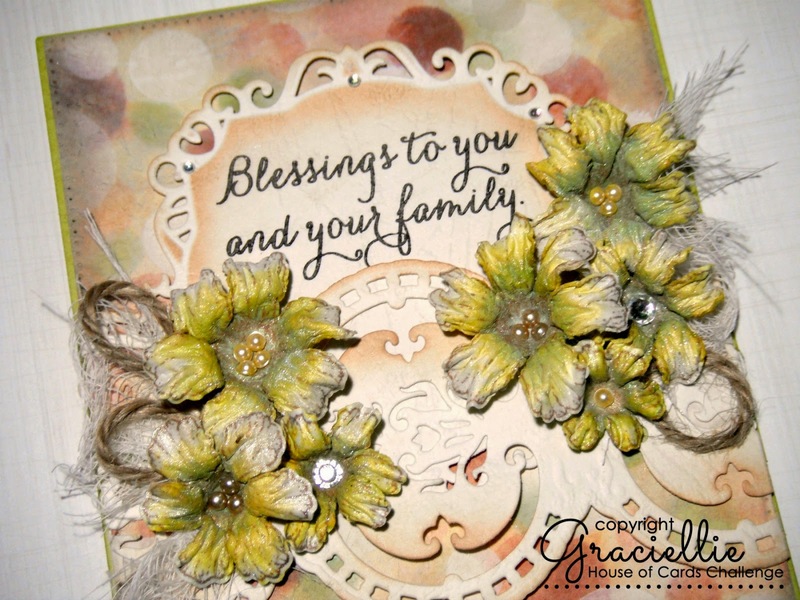 Gracie your cards are always so gorgeous! Love your soft Bokeh effect for your background with the stunning yellow gold colors! Have a great day! I love the soft earth tone colors of this wonderfully vintage bokeh card! Lovely card, great background and the colour combo is just fab! Beautiful card Gracie! Love the pretty flowers and the background colors! I love the Bokeh technic and your card is so beautiful with the naturally colours. So pretty, love your details! STUNNING card girl! You just amaze me!